I’ve read on OTG that you’ve sourced some of the plane parts (visors, door handles, etc) on eBay. From my searches it seems like most of these parts are legit aircraft parts and therefore carry a huge premium on cost. Trying to brainstorm a cost effective way to add that kind of realism to the cockpit without breaking the bank. Toying with the idea of 3D printing parts. Any other ideas or tips, or even car parts that might give a realistic look without overhead of certified aircraft parts? I got a couple door latches off of a 172 for about $100 from this place. http://aircraftpartsandsalvage.com/index.php Might want to check them out prices seem to be pretty good. I found this list on Facebook. This reply was modified 2 years, 1 month ago by Uriel. Great list. I’m pinning this topic. Wow, that list is great! I just got two leather bucket seats, both side panels and the visors from a Saturn Vue for 105 buck at the junkyard. All in pretty good condition. 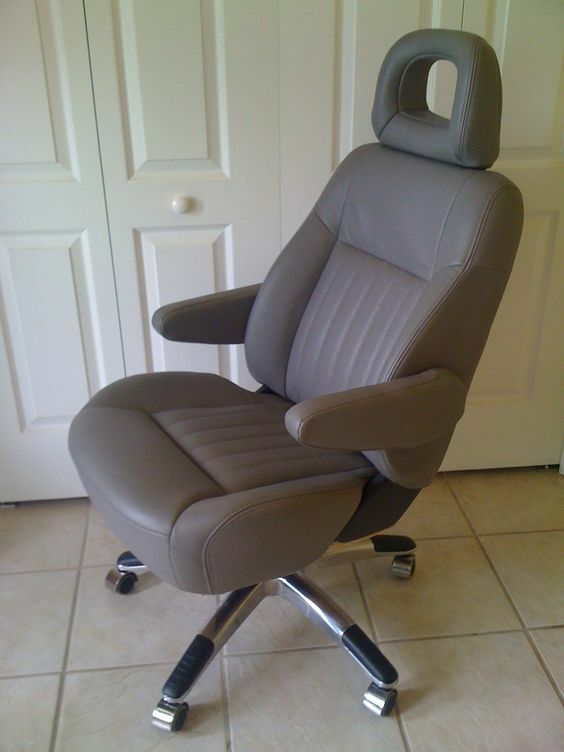 Take an old office chair, remove the chair part, mount the leather bucket seat on 3/4″ plywood (painted, rounded corners, sanded smooth) then mount the seat in the old office chair base….you will have the most comfortable office chair ever….perfect for a sim. If you can get both from a clean car at the yard, your sim will have matching seats! Just avoid seats with electronics as they are a pain to remove. Get manually adjustable seats. Much easier. Then you have things like adjustable lumbar support! TIPS at the Yard: if the cars windows are busted or down, Don’t bother….weather will have wrecked them, rain especially. You want newer cars with closed cabins. SUVs or sports cars are usually the best seats. Downside is most sports cars are there because they were totaled. PT cruisers have great seats for office chairs, easy to remove and to mount. That was my first office chair conversion source. The VUE seats were leather and manual adjustment on both driver and passenger, so I jumped on them. Leather and electric seats usually go hand-in-hand, but not always. Stick with leather as it’s much easier to clean up. Cloth…once the funk is in them, that’s it. Another thing for folks who have never been to a junkyard, bring gloves! Get a cheap pair of mechanics gloves. That place is a rusty cut waiting to happen and it’s filthy lol we know it’s filthy from every junkyard we’ve seen in movies and such…but seriously, screws all over the place, oil in dirt..it’s dirt, dirty lol but fun! Last thing, ask up front how much they charge for the parts you want. Seats, panels, visors, center consoles, whatever’s. The place I go to is a DIY place. You pay 4 bucks and get a wheel barrel. You bring your own tools and go to work. This reply was modified 2 years, 1 month ago by Spankybus. Where was that junkyard that you got 2 leather seats for 105 bucks lol.. I want that name. That is exactly on what I was planning to do for seats, measure and hard mount them to my floor as they were in the vehicle. Hahaha I actually don’t know the name and I’ve been there twice. On highway 50 in or,ando, fl. The cars are arranged in rows, all raised up on diy jacks made of old car rims. Maybe a few achres of land. Most of the cars were pretty well picked over and a lot are just to broke open for my needs…don’t wanna bring nasty, rsin-soaked, mold-growing chairs into the house. LKQ pick your own parts is there name. it really is like fishing. Never know what I will catch. Where can I find window trim that is around the opening of the monitors? That rubber trim is in essence what I used in my sim. I got it in grey. It works reasonably well, but I still prefer the more metallic trim that FlightSimLiberty uses. I’ve been unable to find that although I’m sure it’s out there.